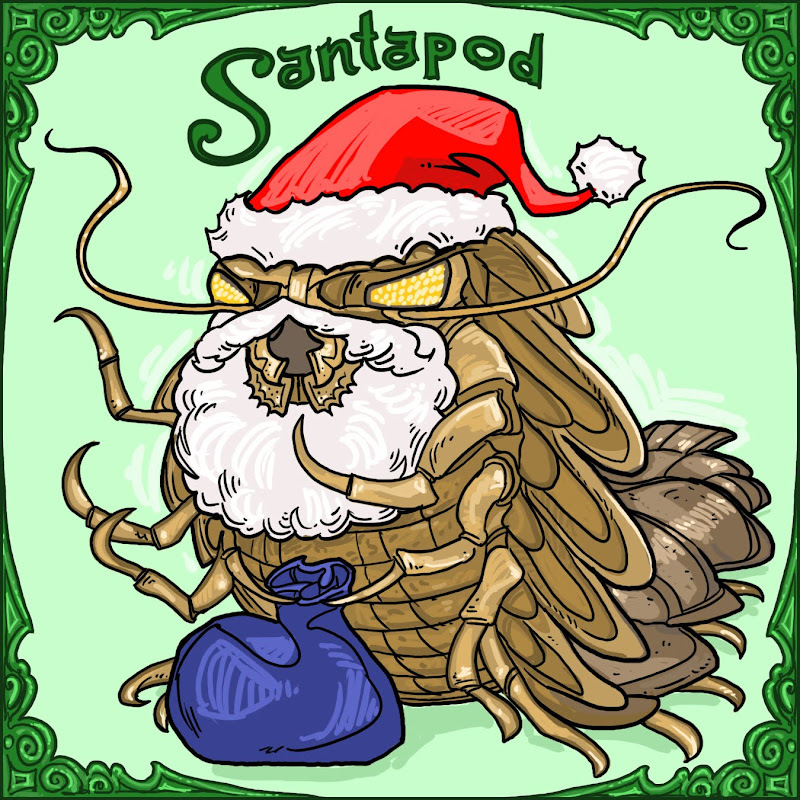 Santapod, the Giant Isopod Santa! He flies around on his sled pulled by eight sea cucumbers. When you leave a treat out for Santapod, skip the milk and cookies, this Santa would much rather gorge himself on a putrefying whale carcass. He's the jolly giant cockroach of the sea floor! This is not the first time isopods have appeared on the blog. Click here if you don't know about Chuck the Lazy Isopod. Scroll down until you see some jesters, then stop and read the posts from bottom to top. You'll learn more than you ever wanted to about these cuddly creatures. Yay for isopods! I want one for Christmas! No, no, Pinnipeds would be adorable Santas. Cute little Seal Santa, Walrus Santa--sure they are mean, but they are too cute to make this list. Great guess though. What about a caveman santa? Stuart, I love the idea of Caveman Santa, but see, he WOULD get his own picture book. (note to self: write Caveman Santa NOW.) This list is of characters who would make BAD Santas. Tell me #3 isn't going to be a Santa. Your blog is a really useful for procrastination. I found someone who would be a really BAD Santa. And my word verification is "nates." Freaky.